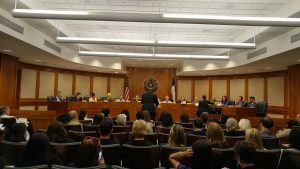 Late in the evening on Tuesday, May 2nd, the House Public Health Committee held a hearing for HB 2107 which would make the Compassionate Use Program more inclusive for patients with debilitating medical conditions. Many patients stayed late into the evening to provide powerful and emotional testimony. After a powerful hearing with targeted testimony, the authors for the bill jumped from 5 to 75! This is historic and unprecedented in Texas. TX resident? Please participate in this action to encourage Chairman Price to hold a vote on HB 2107! Veterans demanded access for service related disabilities. Doctors spoke to the efficacy and safety profile of cannabis. 66 testimonies were offered in support. 187 registered in support. There was only one verbal opposition. It is TBD if there were more registered against not testifying as the full witness list has not been released yet. Continue to support Texas NORML’s work at the Capitol! We are very happy to see that our coordination with the authors and committee members has paid of so well. We appreciated all the speakers that were invited to speak and came to share their story. Thank you to the authors, committee members, staffers, our team and coalition and to all who advocate! Watch the hearing, which starts at 2:33:44. Watch Kara’s story which inspired Rep Lucio III to carry the bill. Thank you to all the witnesses who testified. Thank you Jax, to all the Reps who stayed up past 2:30am (and STILL heard one more bill for the handicapped!) and thank you Justin and Kevin for running this link to this truly historic moment that we can all participate in. Family and patients flew from Colorado and California to testify for this powerfully emotional meeting, so using the national blog to connect people to links is vital, especially if marijuana refugees can use an old address or an address of a relative to write their legislators and even register vicariously through support networks. Try watching this video without shedding a tear. Good luck. Representative Jason Isaac, R-Dripping Springs had to step down from the bench to grab a tissue after hearing from Terry, a known constituent who pleaded to pass HB2107 for her daughter’s severe epilepsy. Texans, click on the link and contact Chairman Price. HB 81 to decriminalize marijuana in the state of Texas is getting a House vote tommorrow!!! Please click the Act tab and contact your state representative now!!! HB2107 passes committee 7-2!!! It has been referred to Calendar Committee. Thank you to all the dedicated parents and patients that traveled to testify! Youre true Texas heroes! I’m so thankful for all who recognized the many benefits of marijuana. Thanks to all who voted in favor. Many of my family and friends need it because they can’t afford big pharma s meds.were getting older now and need help but we don’t like pain meds because of all side effects. Urgent to legalize like others states. Sounds like political hot potato except the potato in this case could save children’s lives. Im having a hell of a time tracking down members of Chorpus NORML. We need them to call Rep. Hunter’s office and tell them they are voting constituents and the Statesman is reporting that Price is saying he filed HB2107 to Calendar so what is the hold up? Children are dying.